This July I made my first trip to the heart of the Canadian Rockies, having previously only been as far north as Waterton National Park along the Canadian-United States boarder. Joined by fellow adventurer Marcus Reynerson, we departed Seattle on a sunny Thursday, bound for some of the tallest and grandest mountains in North America. The Kootenay River flows from the crest of the Rockies through Kootenay National Park to the west, its waters eventually joining the Columbia River and heading to the Pacific Ocean. The massive peaks and glacier dwarf a canoe on Lake Louis, one of the most popular destinations in Banff National Park. Later in my trip I was joined by several family members who dealt admirably with my camera affliction, including here while on Lake Louis. Marcus and I spent a number of days exploring alpine tundra, high mountain meadows, wetlands and riparian corridors searching for tracks and signs of wildlife. Highlights included signs of black and grizzly bears, Canadian lynx, and lots of moose and elk sign. Feeding sign of several species of woodpeckers was another highlight in the dense spruce-fir forests which dominated much of the lower elevations of the mountains. This distinctive pattern on a lodgepole pine is the work of a red-napped sapsucker which drills into the bark to get the tree to exude sap. This sap attracts insects which the sapsucker returns to feed on. Jasper National Park, Alberta. A hoary marmot scampers along an alpine ridge. Banff National Park. A mature bighorn sheep ram lifts his head to pick up scents on the wind. Jasper National Park, Alberta. Clarke’s nutcrackers are ubiquitous in the subalpine forests of the Canadian Rockies. Related to crows and jays, these intelligent birds often linger where people are abundant, hoping to score a free meal. Likely the Rockies cutest mammal inhabitant, an American pika feeds on subalpine plants on the edge of an old glacial moraine. Pika are the mountain specialists of the rabbit family. Banff National Park, Canada. Given my involvement in an ongoing research project on wildlife and road ecology in the Washington Cascades (Cascade Citizen Wildlife Monitoring Project), I was very excited to check out the crossing structures and fencing along Canadian Highway 1 which runs through the Bow River Valley in the heart of Banff National Park. The design of these structures was ground breaking work for the field and much of the design of our project in the Cascades was deeply influenced by this project. A number of crossing structures both over and under the TransCanadian Highway in Banff National Park allow wildlife to cross the highway and decrease the risk of wildlife getting hit by vehicles along the highway. Highways such as this can be a major obsticle to movement of many species across the landscape. Fencing to keep wildlife off of the road along with crossing structures such as this wildlife overpass are part of contemporary efforts to reduce the impacts of roads on wildlife movement in critical habitat. Canadian Highway 1 in the Bow Valley, Banff National Park, Alberta. 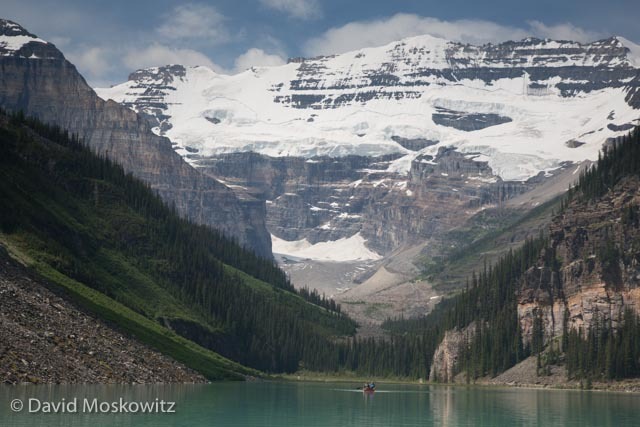 Find a few more images from my trip to the Canadian Rockies in my photography galleries. Still water reflects the evening light and mountains above Maligne Lake. Jasper National Park, Alberta.